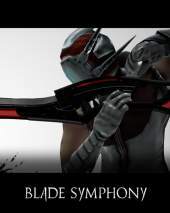 Prove that you are the world's greatest swordsman in Blade Symphony: a slash-em-up featuring a highly detailed and in-depth sword fighting system. Face down other players in skill-based tactical swordplay, in 2vs2 team duels, or participate in sandbox FFA game modes. It's from the maker of Dystopia and uses the Source Engine with Steam Workshop support. Choose between four characters each with a unique fighting style suited to how you want to play. Phalanx, a fencer gladiator hybrid, attacks with long range stabs and a versatile array of side attacks. Judgement, a knight crossed with a samurai, uses hard hitting forward attacks and wide strafing attacks. Ryoku, a vagrant street ninja, attacks with break dance moves and a signature reverse blade style. Pure, an acrobatic wushu style assassin that attacks with flips, cartwheels, extremely mobile. Each character has three combat stances and over forty different attacks. Pair your character up with a sword type to completely change your way of approaching combat: Katana, a well balanced, hard hitting and adaptable sword; Longsword, cause massive damage when parrying your opponents; Foil, a piercing, high damage forward thrusting weapon great for parrying; Scimitar, a weapon based on turning and performing as many cuts as possible; Jian, an agile, responsive weapon great for combos. Every attack has openings that are determined in real-time and efficacy is entirely up to you. Did you start an attack too early? Turn away and end the attack in a safe location. Did your opponent stupidly use a lighter stance? Go in and punish him! By switching stances mid-combo you can chain attacks into your own flurry of death. The fighting system is open for your exploration, you can dash, jump, do an air attack, land, swing sideways with a heavy stance, parry with a light stance, then roll away. Every attack flows from your blade in true three dimensional space. As does your opponents! Swords collide in mid-air and you will need good timing and aim to to defeat your opponent. On March 8/2019, the game was made free to play.